It’s Easy with eSync. Two Way Sync and keep your inventory accurate. Simply click and connect in minutes! Connect your cloud applications and multi location brick-and-mortar stores to grow and automate your retail business. eSync helps you sell in more places than ever. Connect in minutes, no coding required. Easily integrate your point of sale (POS), ERP and ecommerce applications to enable capabilities like cross-channel listings, inventory sync, product data management, order routing, click-and-collect and in-store pickup. Start your free trial today! In a 2016 study by Field Agent, “88% of customers say they use click-and-collect since there are no shipping costs. Additionally, 77% or customers feel it’s easier to find items online, while 51% of customers say they like the instant gratification of buy online, pick-up in-store (BOPUS). Automatically list products from your point of sale (POS) and ERP systems in online stores and marketplaces such as, eBay and Amazon. Increase revenue by making your products available in more places. Avoid double selling and stock outs. Sync inventory levels from your physical stores and warehouses with as many online stores, eBay and Amazon accounts as you need. As items are sold and received inventory levels are automatically updated in all stores. 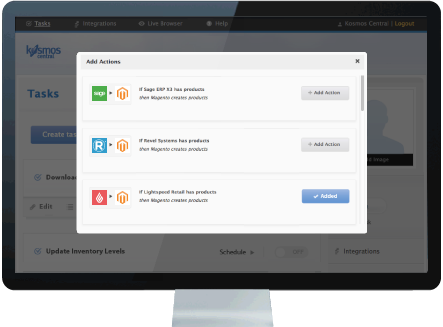 Manage product information in one place. Edit product details, prices and inventory levels in your point of sale (POS) and ERP systems, and product information is automatically updated in your online stores, eBay and Amazon. Fulfill orders faster and more accurately. When orders are placed in your online stores, sales and customer data is automatically sent to your point of sale (POS) and ERP systems where your staff can pack items, print labels, and ship orders. Display inventory from your physical locations to online shoppers. Better serve customers online and in-store by showing if items can be purchased at your physical stores. Give customers the option to purchase online and pick-up items at any store location. eSync can automatically send order details to the stores your customers choose.